I’m in the final steps of finalizing a US distribution with Osiris Entertainment, who will distribute my 2011 feature film Death Grip. Osiris even cut us a new trailer and made new cover art, even asking for our feedback. Pretty awesome. Expect to see Death Grip in the wild by Q2 of 2014! English translation coming soon. “Engrish” translation coming soon after! 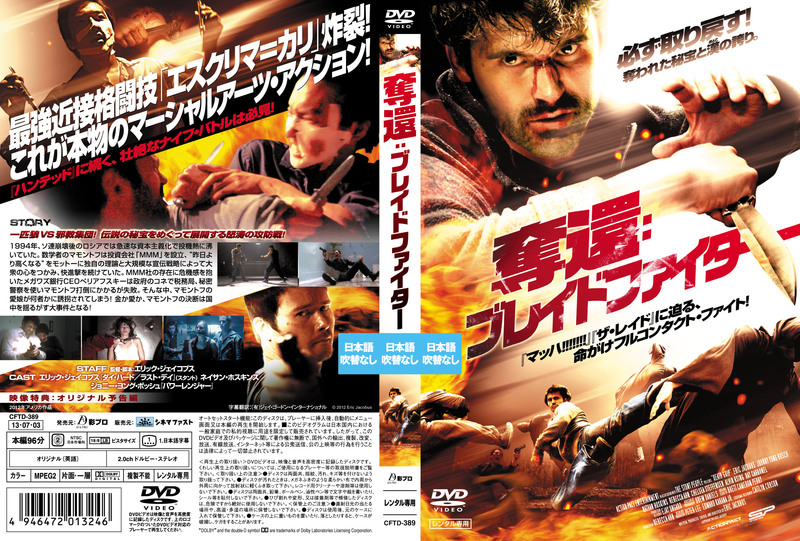 Buy Death Grip on DVD or Blu-Ray at the Stunt People Store. I had the honor to be featured along with Rebecca Ahn on the Comedy Film Nerds podcast with Graham Elwood and Chris J. Mancini. We talk about Death Grip, action movies we love, and other nerdy stuff you’ll all dig. Enjoy. We set about the difficult task of authoring a Blu-ray version of our latest film Death Grip, which you can buy on our website. They’ve been selling much faster than the DVDs because Blu-ray rocks, and I’m happy as hell we did it. I often get questions from filmmakers asking how the process went, so this very pragmatic blog post is about what to expect when replicating a small order of Blu-rays. Because it’s nowhere near as easy as replicating DVDs. If you’re a veteran at making DVDs, move down to the Blu-ray section by clicking here. Being of the do-it-all mentality, I always like to edit our films and put them onto DVD for direct-to-consumer (DTC) distribution. When making a DVD, you go through an “authoring” process where you take your edited product and drop it into an authoring program (DVDit, Encore, DVD Studio, etc. ), where you make menus, playlists, Easter eggs, and all that fun stuff. The authoring system then takes your DVD “program” and translates it into a standard format that every DVD player can understand. Despite the occasional glitch popping up, I’m amazed that, given the diversity of DVD players on the market, these authoring systems basically have a 100% success rate at making compatible discs. If you work in software, you understand how improbable this is. You have two options for distributing your freshly authored DVD. Burn or duplicate your own DVDs, print your own labels and sleeves, buy your own boxes, and shrinkwrap them in cellophane (or tin foil, that could be kind of charming too). They’ll be purple underneath, some of the labels will be crooked, you’ll experience compatibility issues with older players, and you’ll spend hundreds of hours. For small batches, this is a good choice. Send a DVD or an ISO (a file of the DVD) to a factory where they replicate your order onto a silver disc, print the label onto the top of that disc, and do all the packaging for you and even shrinkwrap the thing, all for roughly $0.99 a piece. If you want to make more than 100 DVDs, this is the way to go, though most replicating facilities won’t print fewer than 1000 units. If you sell your DVDs for $10/pop, that’s a hefty profit. For anyone hoping to sell their film to more than 100 people, I recommend option 2. It’s easy, and there are companies everywhere that will do it for you. What about piracy protection? No problem. Replication plants offer CSS (Content Scramble System) for a small fee, which is usually bundled with the overall cost. All CSS keys are encrypted exactly the same, so the replication plant has no hurdles to jump through. This has its disadvantages, obviously, since CSS is easy to crack and was cracked within 2 years of its creation. Turns out the US Gov. wouldn’t let its authors encrypt with more than 40 bits. If you have an odd fascination with stuff like this the way I do, you can read more here. It’s a sad, but hardly surprising, example of government being far behind the curve of innovation. When making Death Grip, I assumed making a Blu-ray disc (BD) would be the same process. Run the authoring software, burn a disc, deliver to a replication facility and get a thousand made. The authoring part was the same as making a DVD. More options are available, since Blu-Ray machines have a standard operating system that can do more complex processes than DVD players. Moving menus, picture-in-picture, etc. I didn’t want to go down that rabbit hole since our timeline basically gave me 24 hours to author the entire disc, so I just authored the same menu structure as our DVD, burned a BD out, and it worked on the first try. Great. Now just deliver it to the replication plant and we’re done. Not so fast… there are two new acronyms to worry about. One is called BDCMF (the file format), the other is called AACS (the encryption standard). Rivergate makes one called BluStreak Tracer. It’s $600. The programmer emailed me after buying it to ask if I had any questions about how to use it. Good customer service. It’s also fast, and you just import your ISO, click “make BDCMF” and let it go. It worked for me on the first try. Sony has a program called DoStudio Indie. Cute huh? It’s $3,000. That’s the entire budget of Immortal. There’s a third option that’s $1000, but I won’t even bother with a link. Just get Rivergate. The other hurdle is AACS, Advanced Access Content System. Unlike CSS, every BD disc has a unique encryption key supplied by the AACS Licensing Distributor. You pay a fee for it, and you can’t replicate a Blu-ray without an AACS key. (DVDs may be similar with regards to CSS, but the hurdle is far smaller.) This is a bureaucratic step, so you’ll need to budget another couple days so this can be done. Your BD replicating facility deals with it all and wraps it into the cost of the replication. Sony, BD players, and studios came up with this hurdle because of piracy concerns. Blame whoever you want, the fact is this is the reason AACS Keys are now a necessary step toward getting your BDs made. There’s one more issue to consider: the number of Blu-ray replication facilities is extremely small. We had a hard time finding one, and they could only do single-layer BDs (maxing out at around 2 hours of content). Perhaps in higher quantities they would’ve done dual-layer, but not for us. They even required the sleeve printing be done at an external facility. Due to all the costs of going HD and making a BD, major studios and distributors are the only ones utilizing these replication facilities, and the standard Blu-ray replication job is on the order of 50,000 units. Ours was 1,000 units, so you can imagine the excitement of the sales rep when she had to walk me through every step I’ve just outlined. It’s simply not worth replication plants’ effort to do your crummy order of 1,000 Blu-rays, unless you do it perfectly and require no further attention after sending them your hard drive. We went through hours of troubleshooting, multiple overnight FedEx deliveries, and a lot of wasted authoring time because the information simply wasn’t out there. Even in making 1000 BDs, we’re still considered very small fish, and we don’t know jack because nobody’s really done this stuff yet. Hopefully this helps you. Filmmakers always want to know what goes down at the American Film Market. As I probably mentioned a few times, Death Grip attended AFM in 2011, and while the price of admission was steep, the learning experience more than paid for it. Stacey Parks of Film Specific recently interviewed us for her latest case study on AFM, and Death Grip‘s producer and co-star Rebecca Ahn gave a lot of insight into the current film market and how it impacts independent action films. Today I’m going to introduce you to Rebecca Ahn and Eric Jacobus whom I worked with as private clients on their film Death Grip. As you’ll see, even though Death Grip wasn’t finished by the time AFM rolled around, Rebecca and Eric decided to make the trip anyway (from San Francisco where they’re based) and see if they could start drumming up interest for their film. Every year, hundreds of filmmakers show up on the AFM doorsteps with films in the post production stage in hopes of finding distribution interest for their films. But where I see most filmmakers fail is when they show up grossly unprepared – without the proper presentation materials and without any meetings set up… and as a result, most of them go home frustrated. In this case study, you’ll see how Rebecca and Eric did things a bit differently by going in prepared…yet learned some very valuable lessons of what they could have even done better. An Action Kickback film by Eric Jacobus, which takes Kenny Zemacus and his autistic brother Mark deep into the deadly world of the mysterious Coin of Judas and the murderous cult that will stop at nothing to get their hands on it. In the end, we will have spent just over $100,000 to produce Death Grip. What stage were you at with your film for AFM and what was your strategy and overall goal going in? We were in post-production on Death Grip when we attended AFM last year, so our goal going in was to find either interested distributors or at least a reputable sales agent to take on our film. What did you do most to prepare for AFM? We did our research and identified several distributors and sales agents we thought would be a good fit for us and our film, then reached out and set up several meetings throughout the market. We then worked hard to put together a solid sales one-sheet with great cover art on one side, and cast & other important production info on the other. Since Death Grip was still in post-production, we didn’t have a final screener to take with us. So instead we took DVDs with the trailer and a few rough scenes from the film to show prospective distributors. What were some of the obstacles you encountered (if any) and how did you overcome them? Our biggest obstacles came from the marketability and timing of our film. While the sales agents we met with at AFM seemed satisfied with our content, they continually expressed concern over whether we had adequate name talent. We hadn’t fully understood how singularly essential this one element can be to distributors, pretty much above all others, and this limited our ability to connect with some of the more established sales agents. In addition to that, we went to AFM while still in the early stages of post-production on Death Grip, which meant we didn’t have a polished looking product and our trailer wasn’t as strong as it could have been. This also hurt us in our AFM meetings, and though some sales agents were able to see past that to the film’s potential, we definitely would have made a stronger impression if we’d brought a completed screener, or at least an extremely solid trailer. What were some of your biggest mistakes or wastes of time with regards to AFM? Going into AFM, we were still a bit fuzzy on the difference between a distributor and a sales agent. We realize now, looking back, that it was not as realistic to pursue deals directly from distributors there (especially not foreign) given the package of our particular film. So I do feel we wasted some of our time in contacting and pursuing distributors who would rarely give a film of our level their precious time. In the end, our conversations with sales agents were far more rewarding than those with direct distributors, so that is an area where we could have used our time more wisely. What resources or tools did you find most helpful in preparing for and attending AFM? FilmSpecific.com was by far the most valuable resource for our AFM preparation, as well as for producing Death Grip in general. We were also fortunate to work with Stacey Parks on our marketing and distribution strategy. Beyond that, we just researched every site and resource on film markets and distribution we could find, and talked to everyone we knew who had been through it before. So we felt very well prepared going into AFM. What was the outcome of your trip to AFM and did you accomplish your goals? At the end of the market, we left with a good number of positive leads from sales agents, which later developed into several full offers. Our hard work at AFM was rewarded, and we were able to compare and negotiate these offers and select the very best one for us. So in the end, we did indeed accomplish our goal, and now have our ideal sales agent WonderPhil representing Death Grip. How you brand yourself is just as important as how you brand your film. Although we had prepared solid materials for our film, we didn’t focus enough on materials about ourselves – namely our business cards. We did have some on us, but they were hard to read and a bit outdated, since we made them for an older company. I sometimes wonder if we would have had more success had we brought more professional business cards with our current production company and roles. Armed with these, we also might have had more courage to make more frequent introductions. We didn’t quite realize the importance of impromptu introductions until the end of the market, and therefore missed out on a good many additional opportunities. We had our schedule of meetings, but didn’t take as much initiative between them to pop in and introduce ourselves at other companies we hadn’t reached out to yet, but were still a potentially good fit. The few times we did do this, it lead to something more. So we left feeling like we could have done more there. We are proud to say we finally released Death Grip a few weeks ago with our own theatrical premiere, which was extremely well received and has already been earning numerous glowing reviews (http://deathgripmovie.com/press). It is also now available on DVD and Blu-Ray at our online store (http://stuntpeoplestore.bigcartel.com), where sales have really been taking off! So next, we will be working on building up more press, trying to get into a film festival or two, and helping our sales agent sell rights to more territories around the world. At the same time, we are also developing our next two projects, which we’ve gotten to the script stage and are now packaging with financing and cast. So it’s onward and upward for us! Short on change and don’t feel like buying Death Grip? No problem! Check out Kung Fu Magazine’s latest sweepstakes – a DVD of Death Grip signed by me and co-star and producer Rebecca Ahn. I’ll even add an incentive: if you’re a reader on this blog and you win one of the DVDs they’re giving away, I’ll send you an additional autographed page which has our signatures plus those of the other main cast including Johnny Yong Bosch. Winners can just email me and I’ll send it off after I double check with KFM that you’re actually a winner and not just trying to get free schwag. So make sure you enter to win! Speical thanks to Gene Ching and Tiger Claw for the promotion.